We have an expanding selection of awareness and promotional products related to Quality Management. These (and thousands of other safety-themed promotional products) can be purchased as-is, customized or we can create a new product design for your needs. Along with our Quality Control, take a look at each of our other safety categories to the left for many other product lines that help you reinforce your Water message. 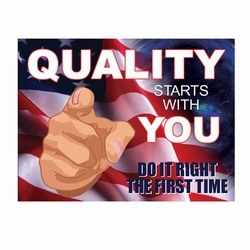 Hundreds of organizations use our quality management posters in their quality awareness plans. They are available in a standard 12" x 18" size and other custom sizes as well. With many posters to choose from and custom designs available, we're able to create awareness for all of your Quality goals. 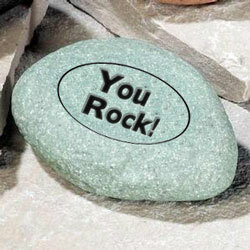 Our products are great reminders that encourage behavioral change, when you’re not there to do the reminding. Our experienced people will have many ideas and will make it easy for you. 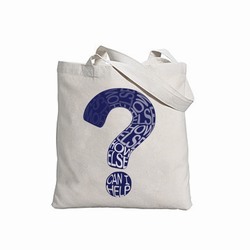 Looking for a great gift for the Quality Assurance champions in your business? We carry Quality themed handouts of all kinds including corporate gifts, mouse pads, notepads, information wheels, squeeze stress toys, t-shirts, drink ware, writing utensils and more. With a properly themed message, our Quality Assurance handouts become expert motivators. Our quality products are great reminders that encourage behavioral change, when you’re not there to do the reminding. Our experienced people will have many ideas and will make it easy for you. 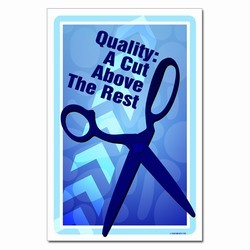 There are so many quality control ideas that go with quality products. We have unique ideas that change the way one thinks of quality assurance process. Please see our many great assurance ideas on issues like QS 9000, ISO 14001, ISO 9001. When a message of Quality Process is important, say it big! Use of our banners placed in strategic locations will remind your employees of Quality Process goals. Banners are available in many standard sizes or we can customize the size, style or message of any banner to meet your needs. Our quality process banners are great reminders that encourage behavioral change, when you’re not there to do the reminding. Our experienced people will have many ideas and will make it easy for you. Smart quality assurance banners take notice of how serious quality awareness for issues like QS 9000, ISO 14001, ISO 9001. There are other quality control ideas that can be used in quality assurance banners. Have you been providing recognition awards to the quality assurancechampions in your facility? If not, we carry over 3000 easily customizable awards in glass, crystal, marble, granite, cultured stone and a variety of other materials. If you don't see an award that you like and would like us to design a custom award for your energy champion, we can do that as well. Our awards play an important role in causing behavioral change. Our experienced people have many ideas and will make it easy for you. Contact us for details.